Craig Galliano wins the 2018 National Day Darts Trophy! Gibraltar Darts team prepares for the Europe Cup! College Cosmos recently hosted a fours practice competition to help the Gibraltar team get used to the “one-leg” format of the European Cup, in which we will be participating at the end of the month, in Budapest. 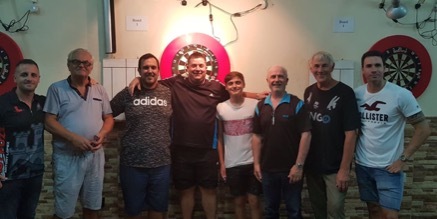 Five teams competed, in what was a very intense evening of non-stop darts, with the Gibraltar “A” team coming out on top in the final 9-1 against the College 501 team. Some excellent darts were thrown on the night, and the Gibraltar team of David Francis, Dylan Duo, Antony Lopez & Tony Dawkins will hope to continue their winning ways in Budapest, when they have to face Hungary, Finland, the Czech Republic & the Isle of Man in the group stages.